Very cool how you’ve caught this watery doggy moment at just the point where the joyousness has become a “composition” too — the diagonal sweep of the wave, the different texture of the two “types” of water on either side. But above all the wonderful roly-poly seal-like exuberance of the dog. Lovely! You got all my favourite bits! The joy, the wave, the two-tone water and, especially, the roly-poly! What a happy dog! Is he a Saint Bernard? I’ve always wanted one of those. Has she just swum across the lake and come ashore? 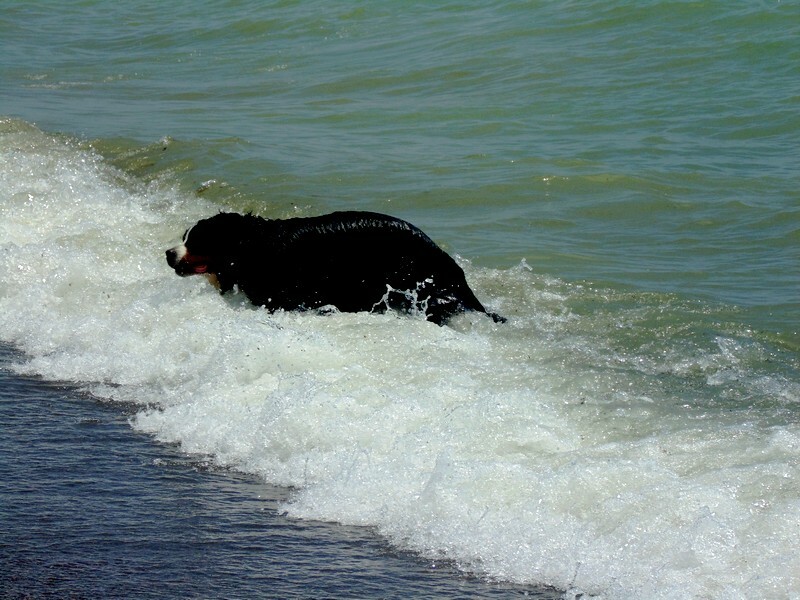 I love the rolling feeling of both dog and waves and the sense of arrival of both. Looks like a Berner, Carin (Bernese Mountain Dog). Love that energy and the playful spirit, both of which you captured so beautifully. Saw this puppy at the beach yesterday. It was so hot and s/he was so happy. Wanted to bottle, or at least capture, some of that sopping wet joie de vivre! Perfect picture, colours, texture for a hot and sticky day. I’m so glad it refreshes. That was its intention. Such a wet and happy photo!